Command and Conquer dev Victory Games says "The days of boxed releases are probably over." Many diehard Command and Conquer fans were disappointed to see their beloved franchise turned into a free-to-play title. Not quite as disappointed as they were with the abomination that was Command and Conquer 4, but still pretty bummed. It looks like they will just have to get used to it, though, as developer Victory Games explains that the free-to-play platform created for the upcoming Command and Conquer 2013 has been designed to support ten years worth of continued content. "I think maybe the days of a boxed [Command and Conquer] release are probably over," explained Victory Games' general manager Jon Van Caneghem. "From both a features and an ongoing, adding-to-the-product point of view, it was more exciting to go the free-to-play route than it was the boxed route." He clarifies that he isn't talking about the upcoming Command and Conquer 2013 title sticking around for ten years, but rather, the platform behind it, that functions much like Battlefield's battlelog in keeping persistent log-in details and online persona. "We definitely believe it will [last 10 years]. And if we can keep it updated it'll last even longer" said Van Canegham. But Van Canegham understands that collectors are out there, and he hasn't completely ruled out the possibility of some kind of Collector's Edition. "There's always a need sometimes for Collector's Editions that are nice to put in a box where you get extra materials, so that's not out of the question [for Command and Conquer 2013]." 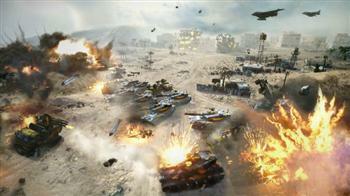 Command and Conquer 2013 should be out some time later this year.